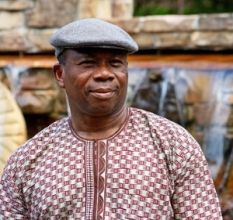 Prior to joining the faculty of the Seminary in 2001, Dr. Adewuya and his family lived in the Philippines as missionaries and church planters. He currently serves as a member of the Board of the Tennessee State Church of God Ministerial Internship Program. He is the author of Holiness and Community in 2 Cor. 6:14-7:1 – A Study of Paul’s View of Communal Holiness in the Corinthians Correspondence (New York: Peter Lang, 2001); Transformed by Grace: Paul’s View of Holiness in Romans 6-8 (Eugene Oregon: Cascade Books, 2004); and A Commentary on 1 & 2 Corinthians, ISG 42 (England: SPCK, 2009). He has also published academic articles in various journals and written essay chapters in books. He is a regular contributor to Precepts for Living, a Sunday School Commentary for African Americans published by Urban Ministries Inc., Chicago and the Evangelical Commentaries of the Church of God Cleveland, Tennessee. In addition to his passion for teaching, research, and writing on the subject of holiness, Dr. Adewuya is committed to bringing his African-ness to bear on New Testament interpretation. His recent publications include “Holiness: Reclaiming the Doctrine” in Issues in Contemporary Global Pentecostalism. Cleveland, TN: Pathway Press, 2012; “The Spiritual Powers of Ephesians 6:10–18 in the Light of African Pentecostal Spirituality” in Bulletin of Biblical Research 22/2 (2012); “Reading Ephesians 6:10–18 in the Light of African Pentecostal Spirituality” in Global Voices: Reading the Bible in the Majority World. Peabody, MA. : Hendrickson Publishers, 2013; “2 Cor. 7:1 against the Backdrop of African Purification Rites” in 1 & 2 Corinthians texts@contexts. Minneapolis: Augsburg Fortress, 2013, and “The Supernatural in Ephesians and a Critique of Scientific Rationalism” in Global Perspectives on the Bible. Boston: Pearson Education, 2014. He is an active member of the Society of Pentecostal Studies, the Wesleyan Theological Society, the Society of Biblical Literature.